Many Turkish baths (hamamlar) had designated areas dedicated to felt production, as their extreme heat and moisture provided an ideal environment for feltmaking, especially during the winter months. The craftsman placed his felt on raised platforms and exerted pressure by pounding his chest on the fleece in order to achieve the necessary shrinkage. 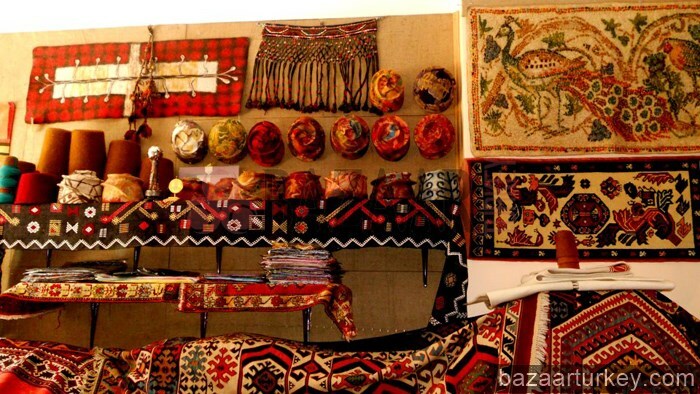 The last hamamlar that produced felt were in Konya and Urfa; by the last quarter of the twentieth century, many hand-felting processes were replaced by machines. Today, in the wool bazaar of Konya, fleece is washed in vast pools of water, aided by a mechanized, rake-like fork that agitates the fibers, before they are rinsed and hung to dry. Carding—the aligning and separating of fibers—was originally done by hand, but is now accomplished by a machine with large steel teeth, that combs the fibers as they are fed through. 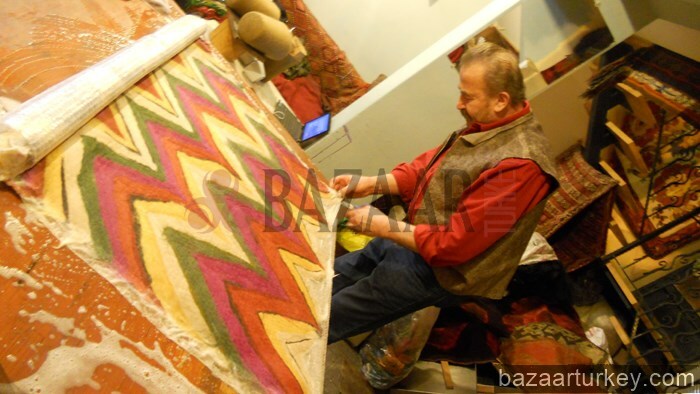 the two methods of patterning felt previously mentioned, Anatolian craftsmen use partially felted fabric of varying colors called “pre-felt” to cut the patterns that form the decorative elements of the carpet, resulting in a more clearly defined design than ala khiz. Once the pre-felt elements are laid in position on the reed mat, they are covered evenly with the background fleece using a forked tool of cherry wood called a çubuk . Additional layers of fleece follow, each sprinkled with water through a long-fibered straw brush before being rolled in the reed mat, wrapped in plastic, and sent to a mechanical “kicking” machine for hardening, the first stage of the shrinkage process. Here it is turned and pounded for three hours, or “kicked” by the feltmakers, who rhythmically roll the felt forward with their right foot and backward with their left, hands on their knees for pressure. Upon completion, the pre-felt patterns are firmly felted to the fleece of the background. Next, the rug is unrolled, the edges are trimmed, and the pattern is adjusted before it is placed in a steaming machine for the fulling. The rug is steamed, turned, and compressed, with olive oil soap used as a sizing agent. 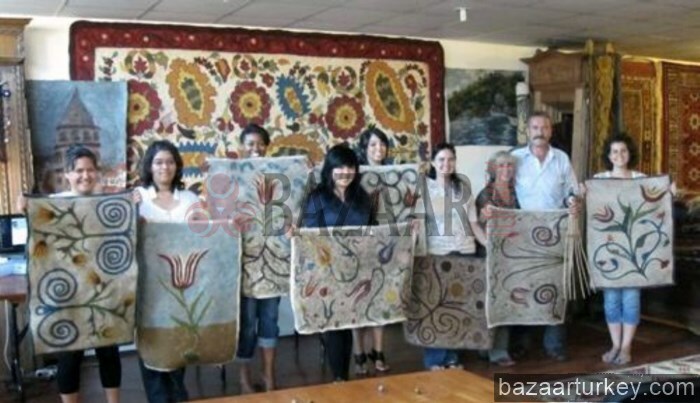 Every twenty minutes, the rug is removed and re-rolled both inside out and back to front to ensure even felting. This process continues for six hours, which causes shrinkage of forty percent and makes the felt impervious to moisture. 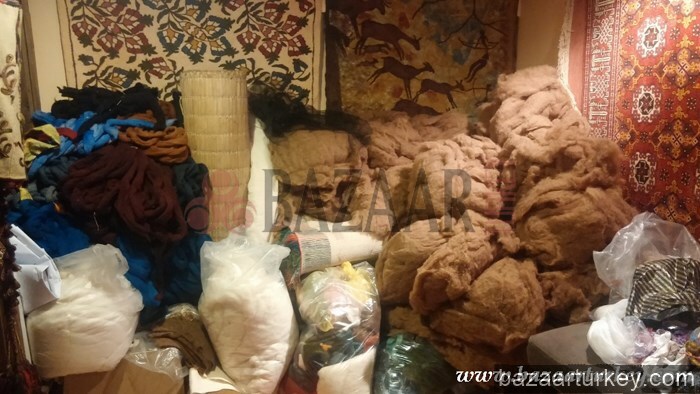 While it is a dwindling tradition, feltmaking workshops in Konyo, Afyon, Tire, Balikesir, Urfa, and Mardin still produce shepherd’s cloaks and carpets. “The last remaining felt makers are to be found in such Turkish provinces as Afyon, Sanliurfa, Konya, Balikesir, Izmir, Kars and Erzurum. One of their most interesting products is the stiff felt cloak known as kepenek worn by shepherds. These distinctive garments protect the wearer from heat in summer and from cold and wet in winter. Indoors, plain felt blankets made of white wool are spread over cushions for sitting on in winter, and felt mats are laid over both seats and beds. Colourfully embroidered felt saddle cloths are spread beneath horses saddles to soak up the sweat. 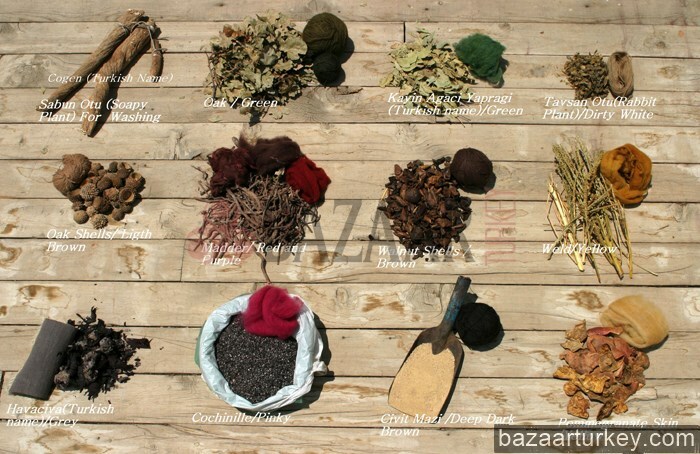 Felt was once an indispensable part of daily life, also used to make saddle bags, shoes, headgear, mats, prayer rugs, and many other garments and household objects in various colors. In the eastern province of Agri you can still see men wearing the traditional kullik, a conical brown or white felt cap made from lamb’s wool. . 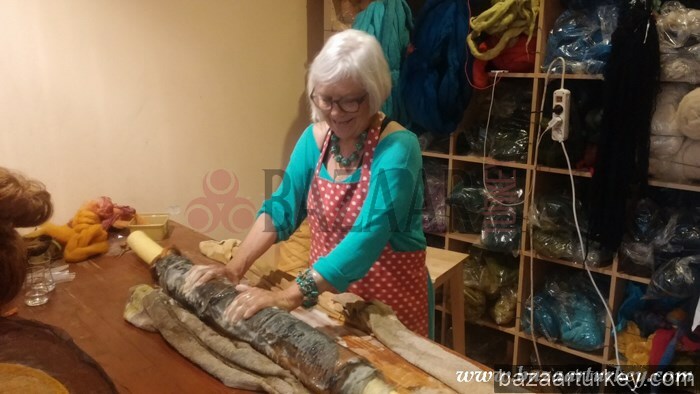 Tags: Felt making workshops in istanbul, kece workshops in istanbul, Felt Making Workshops in Turkey, Felt Making Lessons in Sultanahmet, turkish felt making, Turkish Felt, Turkish Kece Making, Turkish Fel Classes, Turkish Felt Designs, Turkish Art Workshops in Istanbul. 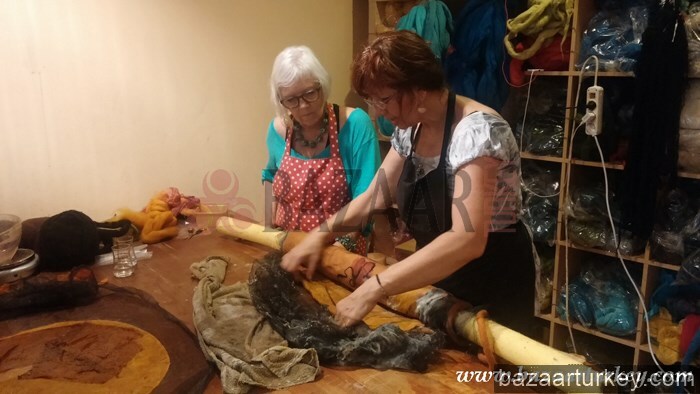 Felt Making Lessons by Bazaar Turkey.